Target Language: Vocabulary, Grammar, verb tenses, active / passive voice, articles, etc. Activity Goal: Test student ability to select words according to context. Can also be used as a listening exercise to test student listening ability. Summary: This vocabulary worksheet generator creates a passage of cloze text. Words selected by the user are removed and replaced with blanks. Students must complete the blanks with the correct words as determined by the context. 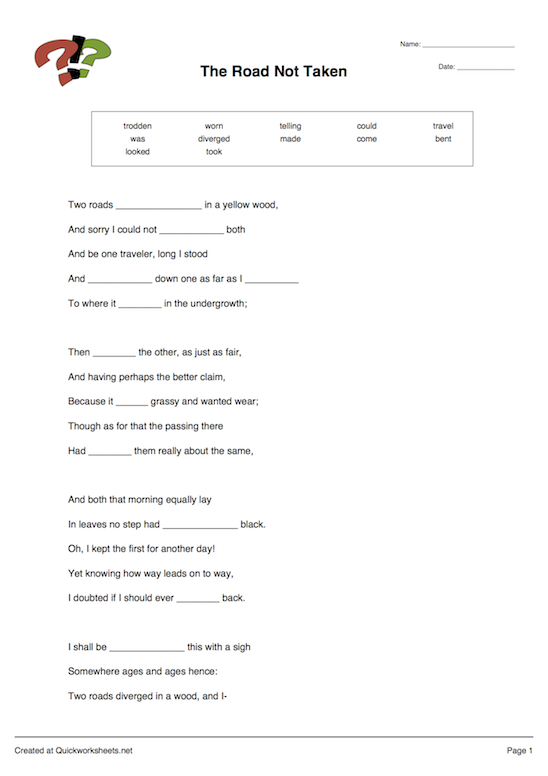 Distribute worksheets containing a short story with a number of verbs removed. Students choose the correct verb and tense according to the context and fill in the blanks. Hold down the OPTION or ALT key when you click a word to remove all occurrences of that word in your text. You can use this powerful feature to quickly make cloze texts with, for example, all prepositions or all conjunctions blanked out. Use as a listening exercise. Students complete the blanks after hearing a dialogue or listening to the lyrics of a song. Use to test grammatical constructions such as verb collocations, pronouns, articles, tenses, prepositions of place, comparatives and superlatives. Students select according to context and the rules of grammar. Use riddles to check student understanding of the meaning of vocabulary: e.g. "This is a car that anyone can use. In New York it is yellow. It's a ________."